Don’t sink on my account! Sometimes I wonder if everyone finds life as bemusing as I do, or if I have been specially selected to go through a regular series of totally bizarre experiences, to see how I come out at the end. Take today for example. I sail. Or at least that’s what I tell people. What I actually know about sailing would probably fill the back of a postage stamp, but no more. Don’t get me wrong, if you put me in a dinghy, I can make it go. My main difficulties are a lack of any sort of control at all over the direction the boat goes, or the speed at which it goes in that direction. Occasionally this can be dangerous, but most people at my club can spot my unique sailing style a mile off, and give me a wide berth. I have also learned a few select sailing phrases and the resulting action I should take if they are yelled in my direction. For example, when sailing round a mark, if someone yells ‘water’ at me, this is not a polite request for a sip from my bottle of Evian. It actually means ‘get the hell out of my way or I will ram your boat because I am totally not going to lose this race just because you can’t sail’ or something like that. Club rules require me to do 2 duties per year. For my second duty (you won’t be surprised to learn that my fist was bar duty!) I chose patrol boat assistant. This was on the basis that I would successfully persuade my dad to do my duty for me. Instead, he went on holiday. I also asked my husband, but let’s just say ‘guinea pig gate’ didn’t stand me in good stead. So, it was that I was stuck doing my own duty. Aside from the cold, the wet, and the fact that there is no loo on board the rescue boat, there are good things to be said for this duty. The two main selling points are that there are no kids on board, and I get a free ride in a speedboat (I am still a kid in oh so many ways). The pre-requisites of a successful rescue duty are your own safety gear (warm stuff and life jacket), and a working rescue boat, known as a rib. Actual tasks are to lay the marks (big floaty things the boats race round), watch the boats, and if anyone gets into difficulty, perform a rescue. Doesn’t sound too tricky right? Why does this kind of thing ALWAYS happen to me. 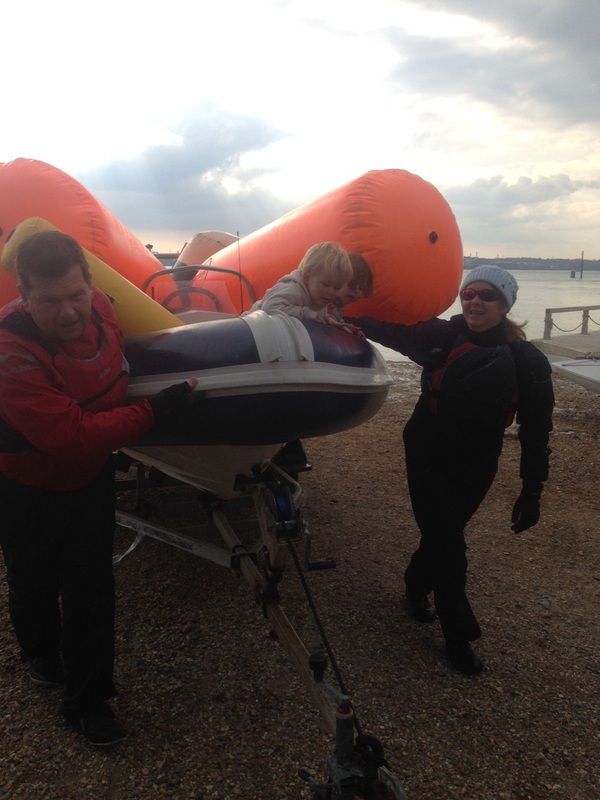 Am I the first person in the history of the club to need rescued by the dinghies that I am there to rescue. Oh wait, none of them are looking this way, so help not coming. What is the number for the coastguard. ok, let’s call the coastguard immediately. We are sinking. Luckily for all concerned, I was assistant patrol boat driver not actual patrol boat driver. RodgerBrydges had the great fortune to be in charge on the first day in the history of Netley Sailing Club as I know it that the patrol boat was sinking. Rodger immediately reassured me and advised that the boat would not actually sink despite appearances to the contrary. I must not have appeared convinced as he went on to explain that he was a marine accident investigator and had direct experience of the sinkability or otherwise of a rib. I have to say, I was impressed. Further questioning revealed that a marine investigator does totally cool stuff. It’s a bit like a nautical James Bond role. Sensing a totally exciting new career option, I decided I should impress with my skills of ‘marine investigation’ so that the process of application and interview would be a mere formality should I choose to apply for such a job. I knelt down and identified the source of the gushing water (a big hole leading into the hull from the interior of the boat). I couldn’t find a plug (sorry, bung) for this hole. Apparently the solution was to drive really fast to get rid of the water, and radio shore to tell them about the problem. Radio didn’t work. Engine would not go fast (something to do with revs). I though my suggestion that perhaps there was too much water touching the engine wiring was a good one, but Rodger pointed out that being a boat, it was designed to get wet. I think the point at which I lost any credibility as a potential marine accident investigator was when I checked for the third time and found the large hole in the boat hull leading to the sea. This obviously had quite a lot to do with the volume of water on board, and I had failed to find it the first two times. In my defence, it was under a lot of very cold water. To cut a long story short it seems that the last person to use the boat had totally filled the hull with water. We had taken it out filled, which was why it kept flowing into the boat. The hull was emptying into the boat, and so was the sea. The engine didn’t work as we had so much water onboard. Luckily, at half time we resolved the problem. Rodger let me drive the boat in the afternoon (probably so I wouldn’t tell his boss he doesn’t know a rib has a plug) and we successfully rescued someone’s rudder and tiller. 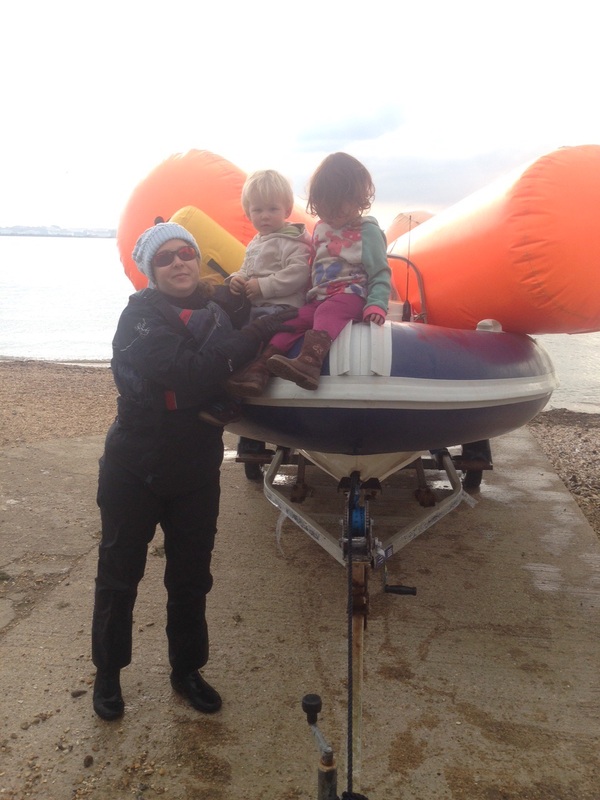 The only slight hitch came when Rodger told me to collect the inflatable buoys by driving straight at them. I think his exact words were “that will cause the buoy to run along one side of the boat or the other and I will grab it”. It is totally not my fault that he didn’t say I should slow down or turn the engine off before I hit the buoy. I have a pram tyre puncture kit. It will be fine. Anyway, I think I might be consigned to bar duty from here on in. It’s not such a bad life, eh Rodger? Your shout at the bar (boat plug and all that!). This is Netley2 over and out.